Original Painting: America The Beautiful by Kendyl Born. Kendyl Born, 19, is the artist. She is Nita and Troy Born’s daughter and Cathy and Phil Karr‘s granddaughter. Kendyl has been doing aspen paintings showing the four seasons of Colorado for several years and sells them at craft fairs around Evergreen and Denver. 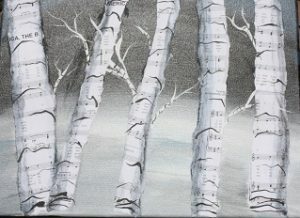 She paints the background first, then tears from sheet music of America the Beautiful for the trunks. Finally she paints the branches. These usually sell for $50.00 to $100. She has other sizes and greeting cards. Like most beginning artists, she is not able to support herself with her paintings…so far! We are pleased that Kendyl Born has donated an original to our Connecting Our Community Dinner and Auctions. Thank you, Kendyl!